Here are 5 essential things to look for when you buy a diagram pack for your business presentations. The information in this article might save you hours of frustration in the future. What do you look for when you buy templates for diagrams? Is it the price? Is it the look and feel of the templates? Or is it the wide choice on offer? 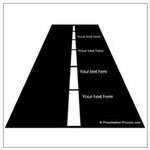 Here are 5 criteria that are far more critical to make your purchasing decision for a template collection. 1. Is the diagram template fully editable? This is the first criterion to look for when you buy diagram templates. Sounds too elementary – isn’t it? But, read on. There is surprise in store. A fully editable diagram allows you much more than just adding text in the placeholder provided. 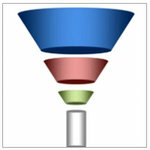 It allows you to edit the components of the diagram using basic PowerPoint tools. You should be able to change the color, add or remove elements in the diagram, animate the components in the diagram and add relevant effects with ease. If the template is not editable the basic purpose of buying the diagram is defeated. Though the criterion looks obvious, it is surprising to see the number of service providers who offer you diagram templates that are not fully editable. They provide you images of the diagrams instead of offering you editable diagrams created in PowerPoint. 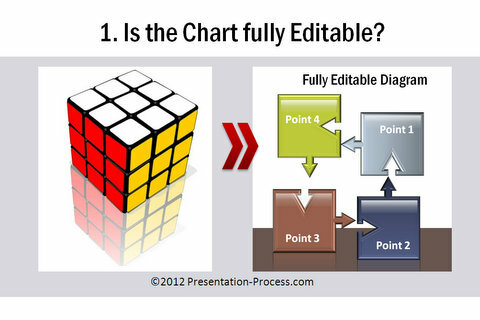 You may not be able to differentiate between editable diagrams and pictures just by looking at them. You need to read their descriptions carefully before buying. Why do they offer you images instead of diagrams? Many times, designers engaged to create diagram templates have a background in print design rather than PowerPoint design. They are naturally more comfortable with image editing software like Photoshop. So, while the designs may look visually appealing, the utility of the diagrams is limited – because they are just images stuck on slides. To create truly editable diagram templates, the designer needs to have expertise in PowerPoint or proficiency in vector editing software like Illustrator. PowerPoint experts are not always easy to find. So, don’t judge diagram templates merely by their look and feel. Judge them by their utility. 2. Is the size of the diagram sets bloated? 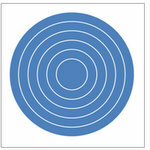 Many sites that sell diagrams offer you bundles or packs. You may get impressed by the sheer number of slides packed in the bundle. Stop! Take a minute to view all the thumb nails (if they are provided). Are the templates truly different from each other or are they making up the numbers? Bloated diagram sets have versions of the same slide. For example, the first slide has 3 shiny spheres on a line. The second slide has 4 shiny spheres on a curve. The third slide has 5 shiny spheres one above the other and so on. Since you are charged for the number of slides and not for the idea, you end up paying for all those fillers, which you could have easily created by ‘copy – pasting’ those elements yourself. Why do these sites bloat up their packs? They want to attract customers who go by ‘per slide cost’ instead of the quality of offering. They get you all drooling by promising 275 consulting templates for an attractive price. But, if what you get is slides with 1 arrow, 2 arrows, 3 arrows etc. counted as separate templates – it is time to step back and think about what you are paying for. 3. Do they offer real diagrams or glorified text boxes? 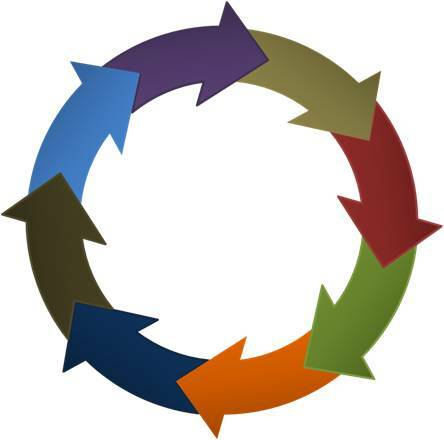 Many sites that offer diagram templates provide no more than glorified text boxes. Writing a bulleted list in 5 glossy boxes in 3D perspective doesn’t enhance message clarity. A good diagram portrays the relationship between objects. The diagram should be able to help you explain your concepts in a simple and memorable way. Now, evaluate the offering of some template sites. Do they really sell diagrams or glorified text boxes? Why do some sites offer glorified text boxes in the name of diagrams? Visualizing information is different from laying out information. Most design experts engaged to create diagrams are hired for their design skills and not for their business know how. Their expertise lies in layout creation rather than diagram creation. To create insightful diagrams that add clarity to your message, a designer should have had corporate or business exposure at different levels. Most sites don’t even mention the profiles of the designers who create diagrams for your critical business presentations. Do you want to rely on them for your presentation success? 4. Are the diagrams tied to a color scheme? Some sites provide you diagram sets in attractive backgrounds. 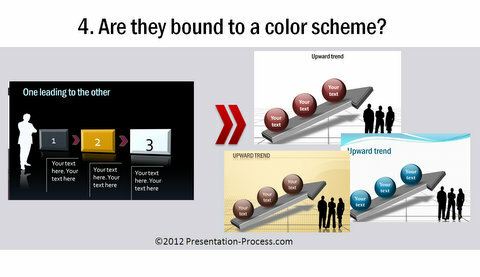 The problem is – if you copy the diagrams to your slide deck they look horrible, because the color scheme of your presentation is different from the color scheme for which the diagrams were optimized. If you work for a corporate, most likely you have restrictions in including fancy color schemes. So, you may not be able to use the diagram set ‘as is’. If you need to spend hours changing colors why call them ready-to-use templates in the first place? Choose diagrams that come in plain white background and use your default color scheme. 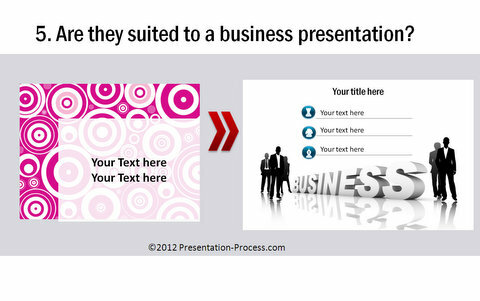 So, you can easily copy them to your slides and they seamlessly integrate with the rest of your presentation. Why do they tie diagrams to their own color scheme? They compensate for lack of variety in diagrams by varying background color schemes. When you visit a diagram template site, take a look at the thumbnail previews of all the diagrams they offer. If you see that different sets look surprisingly similar in their content – the diagrams are most likely not portable across color schemes. 5. 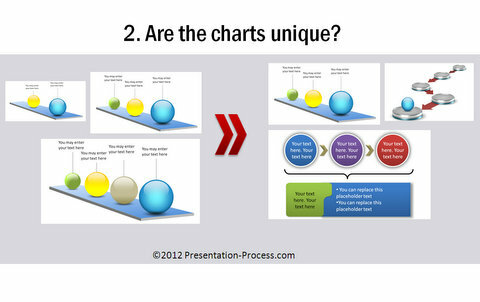 Are the diagram slides really suited to a business presentation? Not all diagram templates are suited for a serious business presentation. Some of them have a dancing 3D man walking on a tight rope, or business executive flying on a dollar bill with Superman cape. Do you want those animated figures on your business presentations? Will your audience listen to your content when they are distracted by such cute animation? Choose a diagram template for the meaning it conveys and not for the cuteness it adds to your slides. Unless you want to address a bunch of college kids who are used to fast-paced game consoles! Choosing a good diagram template is no rocket science. The 5 criteria we discussed above are fairly intuitive and straight forward. Let common sense be your guide in making your choice. Since we too create and distribute diagram templates we chose not to mention the names of the other sites that offer diagram templates. 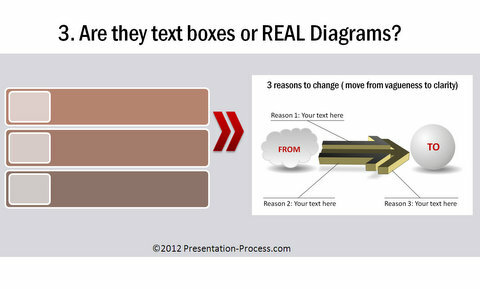 When you buy diagrams, make the right choice for your critical business presentations! P.S. You can read about our qualifications here and view our Comprehensive PowerPoint Charts and Diagrams Pack for CEOs here .